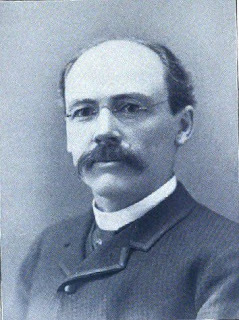 Yes, it's March 13 - the 165th anniversary of the birth of Charles Eadward Pratt in Vassalboro, Maine. Pratt was the first president of the League of American Wheelmen and author of The American Bicycler, one of the earliest cycling guidebooks. Pratt is considered by many cycling historians to be the Father of American Bicycling. A SONG OF THE WHEEL. Out into the road, ere the sun goes down! Shall bear me away from this tiresome town. Where valleys are smiling and fields are yet fair. Where green leaves are fresh and the breezes are sweet. We'll hover, we'll hasten, as joyful as they.